It seems that the future is looking brighter for the nation’s alternative network providers. Over the past six months there has been a visible shift amongst UK policy makers towards backing industry’s resounding call for a full-fibre future, paved by new, future-proof, digital infrastructure. From the Chancellor’s announcement of a new multi-million-pound investment fund in November’s autumn statement, to March’s budget which outlined its first steps, it seems that the future is looking brighter for the nation’s alternative network providers. But why has it taken so long? An unfortunate outcome of being an early pioneer of telecommunications, Britain has long lagged behind Europe and Asia in terms of ‘full-fibre’ development. The UK’s lowly position in building out fibre networks to homes and businesses jeopardises competitiveness, growth, productivity and inward investment – all things we need now, more than ever. Instead, dominated by BT’s longstanding lordship over the UK’s legacy assets, previous administrations have supported the costly and short-sighted strategy of simply extending the life of copper-based networks, rather than embracing the digital age and demanding full-fibre by default. The consequences of this approach are becoming increasingly evident. 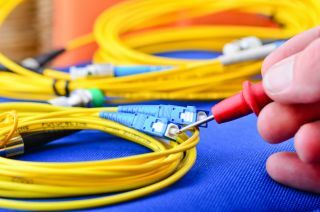 Recent studies have shown that a quarter of UK businesses are still operating with a connection slower than 12mbps, and almost half (40 per cent) have connectivity slower than 24mbps. This is unacceptable. In an era where 80 per cent of businesses employ remote working practices, 75 per cent say broadband is vital to their business and 94 per cent interact with customers and suppliers online, it’s more than just a little bit embarrassing that less than three per cent of British buildings have a direct fibre connection, compared with 83 per cent in Spain. Meanwhile, flagship projects around the world such as Stockholm’s Stokab, Google’s Fiber Cities and Singapore’s NGNBN have pioneered the development of full-fibre connectivity, with transformational results. They have solved urban data bottlenecks, unleashed ‘smart city’ innovation and catalysed growth across local and national economies for the benefit of businesses, public services and citizens. It is important to understand that there is no fundamental economic reason why the UK cannot join the growing ranks of full-fibre nations across the world. CityFibre’s UK Gigabit City rollout shows what can be done, and importantly, that investment capital to provide funding for full-fibre is just as available here as it is in other countries. Now, Westminster is starting to recognise the potential behind Gigabit society, as well as the barriers it needs to overcome to realise this vision. At the most basic level, a rethink is required on policy and regulation. Since the decision was made by the industry regulator Ofcom to promote services competition on Openreach's infrastructure in 2005, progress in building fibre networks has been slow, and in many ways hasn’t gone far enough. Ofcom has belatedly recognised this and in its Digital Communications Review published last year, signalled its strategic direction for the next ten years. This publicly called for a reduction in the UK’s reliance on BT Openreach and a shift towards supporting infrastructure competition and full fibre roll-out. Still however, the Openreach issue has loomed large, with regulatory and incumbent navel-gazing continuing to paralyse the industry as it waits for a resolution. The most recent announcement made on 10 March, however, is encouraging. The agreement between BT and Ofcom to legally separate BT’s access division Openreach in the form of a series of voluntary commitments by BT avoids the need for an imposed regulatory legal separation, which would have required in the first instance a notification to the European Commission. At the very least, this should prevent the continued diversion of time, money and regulatory focus on the ‘Openreach’ problem. The March 10th agreement means Openreach will now have significantly greater independence in terms of day to day operational matters and, to some extent, its business strategy and budget. BT has made some concessions on Openreach’s governance, although the details are quite complex. But for service providers who considered nothing short of ownership separation likely to address their concerns, the concessions BT seems to have secured on budget, governance and asset ownership will tend to reinforce their view that the solution remains inadequate. The real story here, however, is the UK’s shocking ‘fibre gap’, and there is nothing in this announcement to suggest Openreach will now start to build the fibre infrastructure this country needs. Ofcom’s focus needs to shift to encouraging alternative fibre builders to do the things Openreach can’t or won’t do – whatever its legal status. Legal separation doesn’t change one fundamental truth: that much of Openreach’s value as a business lies in the set of legacy copper network assets that it owns, and that a rational strategy for Openreach remains to ‘sweat’ those existing network assets for as long as possible, deferring investment in transformative fibre. This, incidentally, would also be true whoever owned Openreach. CityFibre, as a new entrant with no copper legacy to maintain, is well placed to take on that challenge and to meet Ofcom’s strategic objective of reducing the UK’s reliance on Openreach to get the job done. The substantial Government funding for fibre announced in the March budget will certainly help us to accelerate our own full-fibre rollout programme. And looking at recent Government amendments to the Digital Economy Bill currently passing through Parliament, it appears that the Government is also looking to make sure there is no strategic gap between a pro-fibre industrial policy and the parallel regulatory policy. This can only be good news for the UK and the alternative network providers poised to transform its digital infrastructure. By building once and building right we can safe guard future, growth, competitiveness and productivity as well as entrepreneurialism and future investment by providing this essential, future proof and resilient infrastructure. But we need to make sure our policy makers and regulators stay on the right course. CityFibre, is already miles ahead and delivering fibre to communities across the country. Driven by consumers’ insatiable hunger for bandwidth, the Gigabit City movement is now very much alive in the UK. Our network now spans an incredible 3,200 Km of pure fibre, and is growing by the day. In the past 12 months alone, we have increased our public sector footprint by 5,000 sites. We now span over 28,000 locations, including 10,000 schools. We have also grown within reach of another 70,000 businesses, and this number is set to expand as we deliver plans to develop over 500 business parks nationwide. This is certain to unlock new potential as the ‘fourth utility’ continues to permanently change the way customers, suppliers and employees buy, sell and deliver services. Driving new competitive investment in full fibre infrastructure, could be the single greatest infrastructure development in a generation. But we’re only just getting started.